You are here: Home » Contributors » Upside Down In My Muscle Car! Upside Down In My Muscle Car! Does it make good financial sense? Not really – but it sure makes me happy. So here we are, the Fall of 2011, almost 2012. As the old song goes…”another day older and deeper in debt.” And even though I haven’t taken on any more new debt, I’m deeper in the hole because everything I have equity in is worth less these days; my house, my investments, and yes…even my muscle cars. The big car auctions that are now a part of our TV/Car culture have driven up the value of muscle and collector cars, or at least that is the perception. Cudas, Z/28s, and Boss Mustangs have all reached the stratosphere over the last decade. It got to the point that you could make a pretty good business by buying barn finds, restore them, and make a BIG fortune by taking them to Phoenix in January. The fact that a multi-million dollar franchise could offer all of their cars at auction at “no reserve” made the case that values and prices of muscle cars in particular were going through the roof. 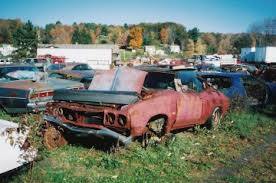 There’s gold in that rust bucket! Well…..there used to be. Well, that business model is in trouble these days. Since collector car values have gone down, putting $60K in a car that is worth $45K or less when you are done won’t make it past the teller at the bank. So, what to do? Where is the comfort? I’m building a car that will have over $60K in it when done, and that doesn’t even include the initial cost of the car, which was around $25K. So this particular project will have $85,000 in it when it’s done with a brand new high-dollar restoration and (maybe) it might bring $40,000 with the right buyer. So why bother? For one very good reason…passion. The car is worth more than the sum of its parts. In other words, a muscle car comes with memories, the thrill of horsepower, and being able to own something from an era that we can only dream about. With the muscle car comes the ability to time travel, to go back to a time when we were all young, a time where Steppenwolf let us ride a magic carpet, and the smell of leaded gas was like aroma-therapy (actually the lead part isn’t all that good), and ram air hoods were real and functional. The old “buy it cheap, fix it up, and make 10x your money” model is long gone….but that doesn’t mean it still isn’t fun! So how do you justify putting more money in a muscle car than it is worth from a financial model perspective? You don’t. Throw out the model and build the car anyway. Put the money in it because you love it — because of what it can do to your soul. I can be having the worst day ever, but when I get in my AMX or Mark Donohue Javelin, it all gets better somehow. A few years ago, when I was in the corporate world, I worked for a very wealthy billionaire. One day in conversation he asked me about my cars. (By the way, he owned some of the world’s most prestigious exotic automobiles, like million-dollar Porsche’s, an Enzo Ferrari, an F-40, etc.) He was asking me about my “lowly” muscle cars. His question was, “What is it like to drive a muscle car?” I said, “Why, you have all kinds of exotic cars! What do you mean, what is it like to drive a muscle car?” He went on to explain that his cars didn’t have a “soul” they were just cars that any rich man could buy. Now I understood, kinda. After thinking about it for a while, I said, “It’s like this. You have 500 HP in front of you and you grab second gear…and there is no other feeling like it in the world!” The look on his face was priceless. The rich guy was suddenly gone, and it was like you and I were in 1970 when we went into the local dealership and saw our first muscle car sitting on the showroom floor. So, in the end, that’s all a long way to say, build the car, and just forget about what it’s worth when you get done. Build it because you want to. Then drive it, look at it, polish it, and dream of Steppenwolf and leaded gas. Just figure time travel is the hidden value that you can’t put a price on! Damn Wayne…….you have hidden talents! 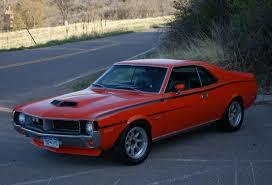 Tomorrow is supposed to be 65 and sunny here ( Niagara Falls NY) and I’m getting the AMX out !! It’s gonna be a long winter! Great artical Wayne! I built mine as you suggest. It gets thumbs up and looks from other people and whether I’m driving it or admiring it I have a smile on my face! The best therapy money could buy is locked up in my garage as I type! yep, nothing like banging second gear in a solid cam 390 AMX and waggin the tail. Great article, Wayne! You captured how I feel everytime I get questions about my Camaro!